DataStax Enterprise (DSE) customers have the ability to define custom, fine-grained access roles for their users. OpsCenter can be configured to require users to log in using OpsCenter authentication. Permissions to perform certain operations can be granted to each role, and a role can be assigned to users. A user can only be assigned one role, and each role applies to all clusters. Note: Authenticating with LDAP in OpsCenter requires defining roles for LDAP users. If using LDAP authentication, users can have multiple roles. Upon logging in, all permissions for each role a user is assigned to are merged. Only those assigned an admin role can manage roles. Each role represents permissions for all clusters managed by OpsCenter. Any functionality in OpsCenter that a user does not have permission for appears as gray and unavailable to that logged in user. If using the OpsCenter API, users without sufficient permissions will receive an HTTP 401, Unauthorized response from the API. Important: In OpsCenter 6.5.3 and later, you must update custom scripts and applications that use the OpsCenter API if you want to use multiple user roles with LDAP authentication. If a custom script or application that uses the OpsCenter API did not account for multiple user roles, and a user has multiple roles, the script or application will fail because the role attribute cannot be found. The single role attribute will be provided for users that have only one role. If your application or script has users with only one role, then updates are not required for continued use. When defining custom roles, each role can have specific permissions enabled for that role. Each user can only be assigned a single role, which contains permissions for all clusters managed by OpsCenter. If using LDAP authentication, users can have multiple roles. 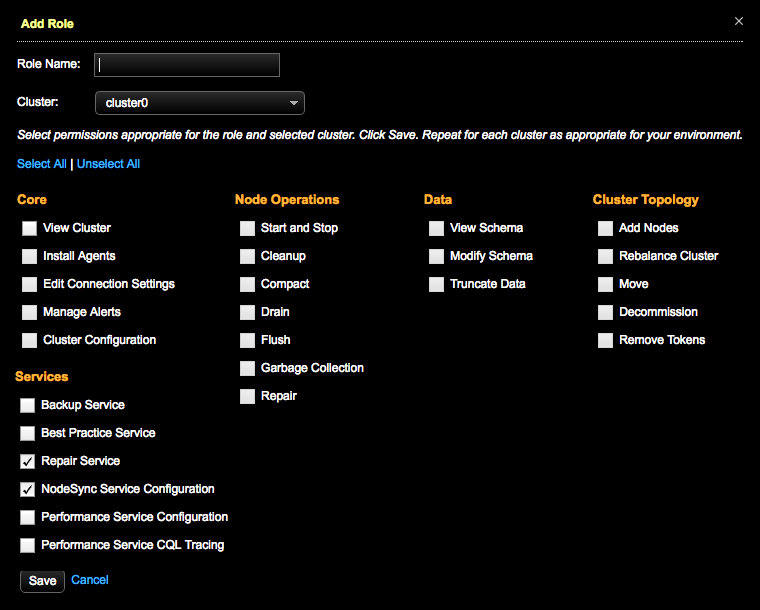 Use the Cluster menu to view permissions for each cluster for a selected role. To hide a cluster for users within a selected role, uncheck all permissions. Installing DataStax Agents Allows users to install or upgrade agents automatically or manually. NodeSync Service Allows authorized users to access status and configure settings for the NodeSync Service. Garbage Collection Allows users to perform garbage collection on nodes. Running GC causes a spike in latency. Repair Allows users to manually run an ad hoc repair operation on selected nodes in the List view. View Schema Allows users to view the CQL statements for the schema in the Data workspace of OpsCenter Monitoring. Users must have the View Schema permission to view Tables, View UDT, View UDF, and View UDA. Those users without view schema permission are shown a message explaining they must have the role permission for viewing anything in the Data workspace, and to contact their OpsCenter administrator to obtain access privileges. Modify Schema Allows users to edit keyspace settings, delete keyspaces, or delete tables in the Data workspace of OpsCenter. Truncate Data Allows users to truncate data from a table. The Truncate link appears as gray and unavailable for users who do not have this permission granted for their role.